Now that I’m older and (hopefully) wiser, I understand and appreciate the unsolicited advice my mom has been giving me over the years. She thought it was her duty as a good parent to pass along the tidbits and lessons. No matter how repetitive it became, she never missed the opportunity to share guidance one more time to make it stick. The tactic worked because I remember the lessons and “get it” now. I internalized them. One that is relevant and resonates to this day is the importance of being self-aware. 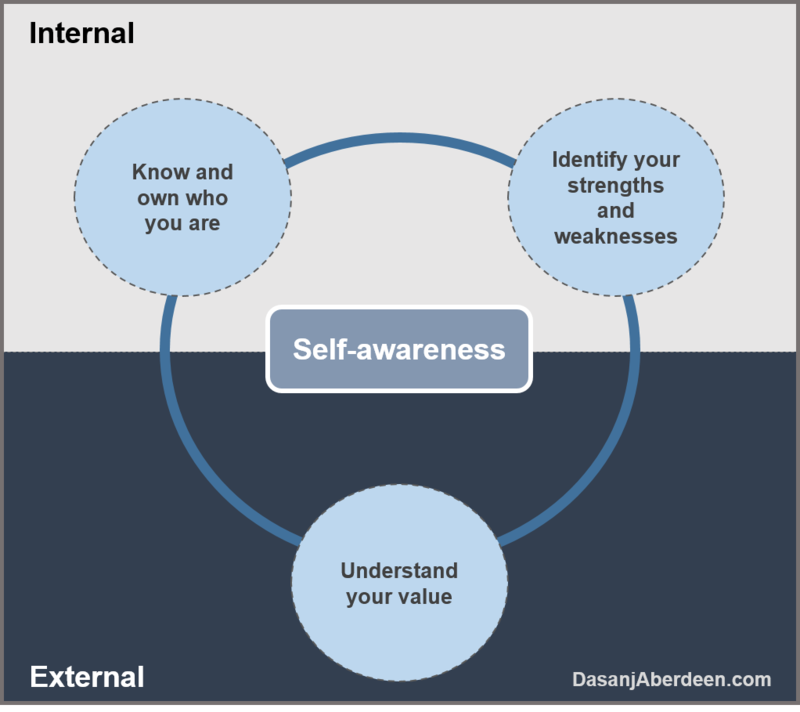 Self-awareness is having a clear view of who you are, your personality and character, including your strengths and weaknesses, beliefs, thoughts, motivation and emotions. Self-awareness allows for introspection along with seeing yourself the way others do in order to understand their perspective. Self-awareness is having a clear view of who you are, your personality and character, including your strengths and weaknesses, beliefs, thoughts, motivation and emotions. Similar to my mom, I’m a big believer in self-awareness and the impact it has on one’s trajectory and success in life. Know and own who you are. It isn’t enough to know who you are. We live in a world with lots of flashy lights, distractions and social media craze. You don’t have to go out of your way these days to see what others are doing which increases the opportunities for comparison, self-doubt and the need to always be doing more. But what others are doing may not be what you should be doing. Your focus should be on what works for you and operating within your zone. It is important to not just know who you are but truly own it and be confident, despite the outside pressures to question it and conform. Identify your strengths. Your strengths are a combination of your knowledge, skills and talents. We all have innate strengths but we also develop some over the course of our lives through education and experience. Once you know your strengths, you can align them with roles that allow you to both enjoy what you’re doing and excel. The key here is to develop strengths so you learn how to use them better than others and apply them to new situations. Further, knowing which scenarios and environments support your strengths can lead to higher performance. Acknowledge your weaknesses. We all have weaknesses. The idea is to focus on your strengths and manage your weaknesses. The amount of effort spent on developing weaknesses will probably not have the same impact as developing strengths. Therefore, once weaknesses are acknowledged, it makes sense to have a plan for them which could include outsourcing tasks that requires these weaknesses. Understand what value you bring to others. What do others come to you for? What do people think you’re good at? What do they say you’re good at? Listen closely and ask. Self-awareness involves aligning your introspection and view of yourself with how others perceive you. If what you identify as your strengths is consistent with what others see you as a go-to-person for, then you’re on the right path.